Scrub the beetroot clean and trim off any gnarly bits. Put the beetroot in a roasting tin or ceramic dish and pour in enough hot water to come about halfway up the beetroot. Season the water generously with salt and pepper, then cover the tin with kitchen foil, making sure you seal it tightly around the edges of the tin. Cook in the oven for 20 minutes for small beetroots and 40 minutes for large ones. Remove the tin from the oven and carefully, using oven mitts, lift the foil. A lot of steam will suddenly escape so keep your hands and face away from the steam. Turn all the beetroot round so they cook evenly,then re-cover and cook for a further 20 or 40 minutes, as above, until tender. Meanwhile, start cooking the pearled spelt, following the instructions on the packet. 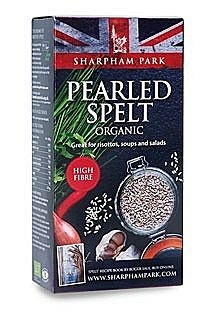 Put the pearled spelt in a saucepan, cover with water and add 1 teaspoon of salt, as you would with rice or pasta. Bring to the boil over a medium heat, then turn the heat down to low and cook for about 10 minutes until just tender. Drain off any excess moisture, then leave to cool while you finish the beetroot. Remove the beetroot from the oven and leave to cool slightly, then drain off the cooking liquid. Using gloves, peel the skin off the beetroot while still warm and leave the beetroot to the side in a bowl until you finish peeling all of them. If there are any gritty bits or bits of skin still sticking to the beetroot, rinse gently under cold water. Cut the beetroot into quarters and put in a bowl. Pour over the raspberry vinegar and lemon juice to taste, then leave to one side. The beetroot is added last so the dish doesn't turn entirely pink.Toast the hazelnuts in a dry frying pan over a medium heat for a few minutes until they turn golden and release that hazelnut aroma. Roll the nuts in a clean tea towel to remove the skins. Season with a little salt and crush into pieces. Scatter the cooked spelt on a large serving plate and sprinkle with the wild dill pollen. 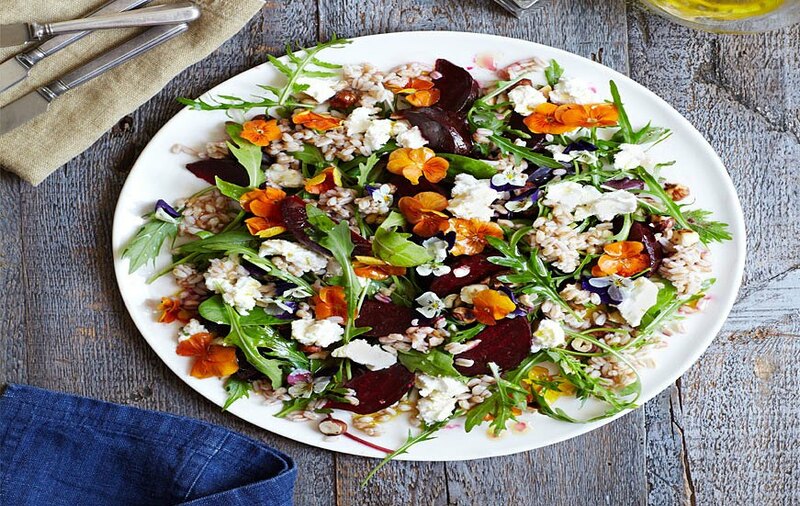 Lift the beetroot out of the raspberry vinegar using a slotted spoon and put on top of the spelt, then scatter with the salad leaves, goat's curd and hazelnuts. Drizzle the vinegar over the top, if you like, or serve separately.